Detailed guide on how to use Moto G 2015 camera ( in Moto G 3rd Gen). In some regions. Android Marshmallow (Android 6.0) update has been rolled out to Moto G 2015 (Moto G 3rd Gen). When you are enjoying the new features in Android Marshmallow update for Moto G 2015, you may notice that the shutter sound setting was removed from the camera app. So, there is no direct ways to silence camera for Moto G 2015 as you can in Lollipop. This is a known problem. But it is NOT a bug because most pre-installed camera apps in Android will remove the shutter sound option due to possible legal issues and some implementation changes in Marshmallow. We are not sure whether Motorola will change mid to bring this feature back. A simple workaround is to lower the ringer volume. The camera shutter sound volume follows ringer’s volume. You can press the volume down button when there are no apps are opened. This will adjust ringer volume. If camera shutter sound does not follow the settings, you may try to clear cache and clear data for camera app in Settings– Apps–Camera. For other problems after Android Marshmallow update, please check this post. As discussed in this post, Moto G 2015 (Moto G 3rd Gen) got significant improvements in camera. The existing camera guide for Moto G and Moto G 2014 (Moto G 2nd Gen) here is inadequate for Moto G 2015. So, instead of updating the Moto G camera guide, a new Moto G 2015 camera guide specially for Moto G 3rd Gen (Moto G 2015) is created here. If you are a owner of Moto G or Moto G 2nd Gen (Moto G 2014), please check the guide here. How to launch Moto G 2015 camera? There are several different ways to launch Moto G 2015 camera. Except for the quick launch (method 1), the methods apply to Moto G and Moto G 2nd Gen (Moto G 2014) as well. Quick launch (new in Moto G 2015). Twist your wrist twice to open the camera in Moto G 2015. This used to be an exclusive feature in Moto X and Moto X 2nd Gen(Moto X 2014). You can use quick launch at any time even when the phone is locked. This is the fastest method to launch Moto G 2015 camera. From Moto G 2015 home screen. In Moto G 2015 home screen, by default, you can find the camera icon. Tap the camera icon to launch the camera in Moto G 3rd Gen. If you cannot find the camera icon in Moto G 2015 home screen, you can add it to the home screen by following this guide. From Moto G 2015 apps screen. Camera icon can also be found in Moto G 2015 apps screen. From Moto G 2015 lock screen. By default, camera shortcut is available in the Moto G lock screen. Drag the camera icon to the left side to launch Moto G 2015 camera. This methods works even when Moto g 3rd Gen is locked. From Gallery app. In Gallery app, you can switch to camera roll. Then you can find the camera icon. Tap it to open camera on Moto G 2015. Please note, if you launch Moto G 2015 camera when the phone is locked, photo editing features will be disabled. In other words, you can take photos or record videos without unlocking your Moto G. You can view them after taken. But you cannot edit them without unlocking your Moto G.
Once you start Moto G 2015 camera interface, you are ready to take photos. As in previous generations of Moto G, there is no shutter button to take photos. You simply tap anywhere on the screen to take photos instantly. You can switch between front and rear camera with the camera switch button as shown below. Tap the video camera icon as shown below to start the recording immediately. There is no switch between camera mode and video recording mode. Your Moto G 2015 camera is ready to take photos and to record video once you start the Moto G 2015 camera interface. If you were using other brands of smartphones, you need get used to it. How to change Moto G 2015 camera settings? Motorola camera app is a bit confusing for new users. To access Moto G 2015 camera settings, swipe to right side on the camera interface as shown above. A settings ring will appear as shown above. You need rotate the ring to see all settings. Just FYI, if you swipe to left side, you will open Gallery app with last photo opened. What are the available settings for Moto G 2015 camera? Although Motorola tries to make it easy to take photos quickly without fiddling around the settings, you may want to change some of your Moto G 2015 camera settings so that the camera can serve you better. To access Moto G 2015 camera settings, you need swipe to right side in the camera interface as mentioned above. The Moto G 2015 camera settings are placed in a ring. You can rotate the ring to access all available camera settings for Moto G 2015. Turn on/off HDR (high dynamic range) effect for better pictures in challenging lighting situations, such as outdoors. The available options include Auto (default), On and Off. Turn on/off Moto G 2015 camera flash. The available options include On, Off, and Auto Flash. Please note, for Moto G 2015 front camera, the flash is actually using screen. Once you turn on focus and exposure control, in the Moto G 2015 camera interface, you will see a yellow focus dial. You can set the camera to focus on the object you tap in the screen. Turn the focus dial to adjust the exposure level. Moto G 2015 camera now can take slow motion videos in 720p. Panorama mode allows you to take wide-angle photos with Moto G 2015 camera. Once enabled, you need follow the on-screen guide to slowly pan while you are taking the photo. You can set a timer for Moto G 2015 camera so that photos can be taken automatically after timer times out without tapping the screen. You can set the timer as 3 seconds or 10 seconds. The default setting is Off. Once enabled, you can add GPS info into the photo taken with Moto G 2015 camera. Of course, you can remove tags later on before sharing them. If Micro SD card is detected, Moto G 2015 will save all photos to SD card, instead of the phone memory. But if you want to save photos to internal storage, you can turn off this option. Moto G 2015 camera app does not offer the option to set photo resolution. Photos are always taken in full resolution. This means for rear camera, it is 13MP (4:3) and 5MP for the front camera. But you can choose the aspect ratio between 4:3 (good for printing or old monitors) and 16:9 (good for TV). You can turn on/off Moto G 2015 camera shutter sound. This camera shutter sound setting is removed in Android Marshmallow update for Moto G 2015. 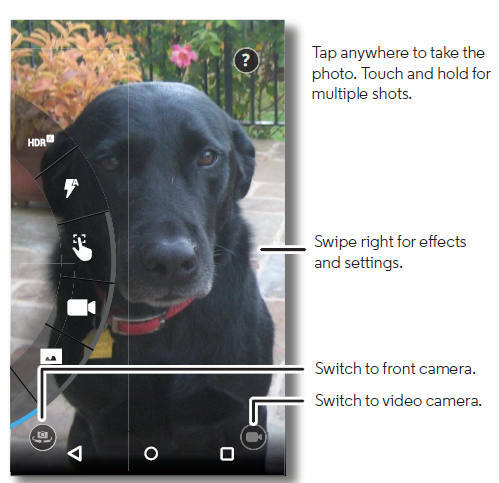 Enable/disable Moto G 2015 camera quick launch. Once enabled, you can wist your wrist twice to turn camera on. Twist twice again to switch to front camera. How to use Moto G 2015 camera burst mode? Moto G 2015 camera also supports burst mode. You can take many photos continuously. To use Moto G 2015 camera burst mode, you just tap and hold the screen in camera interface. Can you use Moto G 2015 camera now? Can you adjust Moto G 2015 camera settings now? If you have problems or questions on how to use the camera on Moto G 2015, please let us know them in the comment box below. Is there some sort of setting for video length? I was trying to record a video and it cut off at 6 minutes saying that it had reached some sort of limit. I’m not very smartphone literate (obviously) so I’m not sure if it ran out of space or what. Anybody have any ideas? Do you use any micro SD card? For normal videos, the length depends on available storage space or 4GB if your SD cards was formatted on the PC. For slow- motion videos, it usually limits to 10 minutes to save storage. The phone may also become very hot if you record slow-motion for an extended period. HOW TO LOCK SCREEN OR DISABLE SCREEN WHILE RECORDING THE VIDEOS IN MOTO G4 PLUS? The screen should not be locked when you are recording . The phone player. What about youtube ?? How i sort out YouTube problem? The video is lagging a bit. Whether i play something in youtube, insta or videos in my phone.the video lag behind audio. The audio will keep on playing but video will b playing 2-3 sec behind audio. Please help!!!!! What app did you use to play local videos? You can try VLC for Android. My Moto G has gone from Hero to a version of Zero overnight, I can’t update because it says no space, no option to move camera storage as no option in camera menu, all apps that can be moved to SD card have been, now can’t do very much above the basic stuff. Cache cleared, camera data cleared, rebooted 2x. No new apps installed. Help please! Also, for the default Motorola camera app, in the camera settings, you can set the storage location. On the old version, you need to rotate the ring to see all camera settings. Since I upgraded to Marshmallow on my Motorola Moto G 3rd Generation, the camera is no longer instant, now it takes 5 to 8 seconds. to take a picture, just to start recording a video and a little more in storage. I have already changed SD and nothing, please help me. You can try to clear cache and clear data for the camera app in Settings – apps. This will reset the camera app. You can also try other camera apps, for examples, Google camera. If you have problems with other apps, you may try to clear cache partition to see whether it helps. My moto g is lagging a bit. Its ram is stuck at 1.6 gb even if I don’t it for 6 hours. What should I do? Android always tried to use all available RAM because unused RAM is actually wasted. Android normally can manage RAM effectively. If this happens recently, you can try tool reboot the phone. You can also try to clear cache partition. Don’t install any memory manager or task manager or similar apps. They will only make things worse. How to reboot or clear cache? Will rebooting it reset my phone data? Reboot Moto G: hold power button for 2-3 seconds, then follow on screen option to power off or reboot. You can alaso just gold power button for more than 7 seconds to reboot directly. To clear cache partition for Moto G, please follow this guide. I have noticed with the MotoG3 that when you take a STD pic it can be as high a 3 or 4 MB – and a video not even of any great size can be over 300MB – SD card and internal memory are used up very quickly and the transferring of pics to F/Book and others is nearly impossible for videos – can the resolution be turned down so that more pics can be kept? The default camera always take photos in highest resolution. It does not offer the option to select resolution. My recommendation is Google camera app https://play.google.com/store/apps/details?id=com.google.android.GoogleCamera You can set different resolutions for both photos and videos. BTW, you should backup photos with Google Photos. Facebook compresses photos and it is not good for backup. We’re working to bring the content you love to more countries as quickly as possible. Google camera app is available in regions where Nexus devices are sold officially. Anyway, you can tap the link in your phone (choose Google play to open) or download the APK files from apkmirror. How do you get Google camera? not on Play and any other sites say it won’t work on the MG3. What is the best photo app? Google camera is available in selected regions (where Nexus devices are officially sold). On my Moto G3, when I set the timer to 10 seconds it often takes the picture before 10 seconds expire, even though it counts down to 0 and seemingly takes the photo then. It doesn’t happen every time but I have reproduced the behavior several times. Also, the second beeps sometimes stop half way through the countdown, and then come back for the last few seconds. What happens when I clear the cache? Some cached files will be removed. It should not affect your data or files. Unfortunately, you cannot disable the burst mode with the default camera app. You can try Google camera if it’s really annoying. Hi, is there any way to take a picture WHILE recording video? Also, i have trouble with zooming. sometimes it works and other times it just does photo bursts or moves around the focus feature. i would appreciate any advice, thanks! No, Motorola camera app doesn’t have the feature to take photos while recording. Smartphone camera apps do not have this feature to print date/time because you can edit the photo on the phone and any text or logos you want. If you want to add date/time on lots of photos (in batch), there are many such apps in the Play store. Yeah I tried and its working fine. in Setting–apps–camera, you can try to clear cache and clear data for camera app. Then try again. My moto g is not able to focus photos properly. Like if we take pic of object that is 15-20 cm away from camera. The pic is blurry. Even if i manually try to focus . It is not able to focus properly( results in blurry pic). What is the problem? Did you try the camera in other camera apps, e.g., Google camera? I have Marshmallow in Moto G3. In the settings I find Focus and Exposure Control is missing. While taking a snap I cannot zoom in or out. Can anybody help me out? Did you try to update the camera app? You can always pinch to zoom in the preview screen. Well! Actually i don’t want to have a camera option on my lock screen..because of a nasty kid at my place he clicks so many pictures because of dat option..hence, I want to remove dat camera from my lock screen so plz help me out…..
You cannot remove the shortcut in lock screen for the default Google Now launcher. I am not able to download google camera in moto g3. Can’t find it in play store and apk file downloaded from net is not opening. What should I do to download it? Is it not possible to download it in moto g3? Google camera app is only available in regions where Nexus devices are available. You can try to download latest one from APKMirror. I am looking to disable the volume key from causing the camera to take pictures. Any thoughts or ideas. Thanks in advance. No, you cannot disable the volume key for taking photos. The feature was baked into the camera app and there are no options for users to change it. i have tried since from dec.to turn shutter sound off but the company is not in a position to get software why they introduced marshmallow is it a good co. It actually depends on the firmware version/region. In some regions where the Marshmallow update was released later, the option is still there. Anyway, you can try third-party camera apps, if lowering the ringtone does not help. Are you using tap to focus feature? Did you try other camera apps, e.g. Google camera? Keep the camera still whilst taking photos. Instead of taking photos by tapping the display, press the volume up button to take pictures instead, which should stabilize photos taken. Swipe the screen (inside camera mode) from the; left- to the right handside that should display a semi-circle with features. It will display a ring on the phone’s display, that you can move around the screen and focus sections of the screen that may solve the blurredness problem. when i swipe the screen from left to right – i do not get the circular settings possibilities, i get a list with shutter sound,storage,quick capture,save location,photosize, shutter type and video size. The camera app in different Moto devices may be different. You are using the latest version. In previous versions of camera app, it is a ring. The latest version is a normal navigation. No, Motorola camera app doesn’t offer this option to record video or take photos with volume button. You need try third party camera apps which may offer this option. Battery is draining alott in my moto g3.even if i using it barely, what should i do? You need check battery usage details in settings- battery to find out apps that drain battery. You can reboot your Moto G to see whether it helps. Will doing reboot cause any harm to phone contents? And how to reboot moto g3? Rebooting Moto G should not affect your phone. It’s just like rebooting your PC. To reboot Moto G, press and hold power button for more than 10 seconds until it reboots. Another way to reboot Moto G is to power off, then power on the phone. To power off Moto G, hold power button for about 3 seconds, then follow on screen option to power off the phone. I know this site is for moto g. But i want to ask something about moto e2. My friend is using moto e2 and the notifications sound are not working in her mobile.whenever there is any notification, the sound doesn’t come. We tried power off option but that also doesn’t change anything. What should she do. Please tell? What’s the notification mode: sound, priority or none? Try to change to sound ( all ), then check volume settings for notifications on settings – sound and notifications. Also make sure when you tap default notification tone, you can hear the time. I have done all the things you told me to.. Bt nothing happen. When we select the notifications sound,, sound doesnt play. What to do? if you change notification sound, do not press back button too fast, you should hear the new notification sound. i have insert sd card in moto g3 mobile but in camera storage location option is not display and as well as sound option is also not display.please suggest. Very likely, your moto g was updated to Marshmallow. if you need save photos to SD Card, you need set SD as internal storage. For the camera shutter sound, it is a known problem in Marshmallow update. After the latest update in G3, The focus icon in camera settings is gone. Do you mean manual focus and exposure control? You can try to clear cache and clear data for camera app. is fully charged. Will it automatically stop taking power supply? You can wake up the screen. It will show you how long it needs to fully charge the phone. If it’s fully charged, it will also show you it’s fully charged. Once the phone is fully charged, you should disconnect Moto G from the charger. The charger is not smart enough to cut off power supply. There is still a trickling current to these phone. This is not good for the phone in long time although it’s safe. It’s not a good habit either. Adjusting ringer volume doesn’t work. Nor does deleting data of camera and then adjusting it. This is a nuisance. And Motorola should fix it in its next update. It has been fixed for Motorola X2 2015. Just not in G3. Motorola should disable camera shutter noise back in its next update. The noise is very annoying. And also unnecessary. After Marshmallow update I am not able to switch off shutter sound of camera in Moto g3… can somebody knows how to do it ? This is a known problem in Marshmallow update for Moto G. The sound settings inside camera app is gone. A workaround is to lower the volume in home screen (when you are not using apps). There are no known problems on OTG in Marshmallow update for Moto G. You can try to clear cache partition to see whether it helps. I accidentally made Google photos as my default camera photo viewing instead of Gallery. It opens in Photos instead Gallery on swiping. Can you tell me how to change the back to default Gallery option? You can clear app default for Google photos in settings – apps – photos. Try again. You can try to reboot the phone. I reboot the phone and done all the things. My Ethernet adapter is also not working now. After rebooting the phone, did the phone as you to update your play services? You also need update many other apps, especially Motorola apps. Ethernet adapter? are you referring to USB OTG? It should still work on Marshmallow. You may try to clear cache partition for Moto G to see whether it helps. I tried to update the Google play services but failed 2 times and now it is not asking.I searched it in play store but didn’t find it. Conference call is also not working after the update. I cleaned the cache partition also. If it’s not asking for you to update Google play services, it means it’s updated already. Otherwise, some apps will ask you to update. For conference call, what messages did to get? No options fr conference call when I dial. Do you have the + option after you are connected to first person? No that is also not working. It’ll be on hold only. Do you have the add caller icon when the phone is engaged with one person? Earlier, I could see the play music bar even on my lock screen. Recently, it has stopped showing both on the lock screen and notification bar. Which music app are you using? Did you disable notification for the app? What happens if you change volume all the way down to silent? Not sure about the issue. I tested and the shutter sound is gone when volume is set to none (vibrate icon). Please read this guide to clear cache partition for Moto G3. Please pay special attention after getting dead Android. Yes, it also works for Marshmallow. You may try to clear cache and clear data for camera app in settings – apps. If the button still doesn’t turn up in camera app, you may have to backup the phone and try a factory data reset. Of course, you can visit local Motorola service center to check the phone. Occasionally, the issue can be caused by some hardware failures. Does it miss any other buttons? No shutter sound option only not coming. Not sure. Did you try to clear cache partition? how to do clear cache partition ?? Sir i updated moto g3 marshmallow but camera sound coming in silent mode also and camera shutter sound settings not coming after rotating setting ring in camera app please inform me sir. When did moto g3 got 6.0 marshmallow. I’m also using moto g3 but I didn’t get the update yet. I think u will get early.who purchased before I think they got I got Oct 31st and u ??? I’m still running with lollipop 5.1.1. I too got the update its size was 53 mb. The only thing changed in my device is menu icon. In your device go to settings–about phone–then tap on android version tell me what does it show. Man i didnt get 6.0 update yet why? R u frm india. I am an Indian from Karnataka only…. Did you try to update all apps from Play store? Sir what to do i really didnt get the update yet.im really shocked now. Update is airways rolled up in phase to avoid traffic jam. Just wait a few more days. I’m feeling very sad cuz I didn’t get the update yet. Just wait a while. If the phone works well and meets your needs, it is not urgent to update. Reboot the phone, then try again. Conference call is not working after the update. What do you mean “not working”? any error messages? I m not getting any option to change shutter sound.. Rather volume button sign is not there in camera settings . Rotate the settings ring in Camera app to find the option. You can turn on/off shutter sound, not customize shutter sound. In my moto g3 quick launch of camera is not working. Did you turn on the camera quick launch? Yes. In camera settings when it asks for try to quick capture it’ll works but when I came to menu and tried to quick launch it’s not working. Did you enable it in settings? Did you install any third party task manager, gesture or antivirus apps? These apps may prevent the quick launch. You can turn off flash light in camera settings. Pull out the settings ring, rotate it and you can find the flash options. my camera quality(G3) is very low compare to other camera(G2). there is ni sticker in camera. i was tried other camera apps. pls give me solution. Unfortunately, there are no easy solutions for such problems. You need identify the problem. Then you can manually adjust the exposure and focus as mentioned in the guide. Anyway, you can try to turn on/off HDR to see whether it helps. my moto g3 turns on the torch when I flick left/right and doesn`t open the phone. also when I press the volume down button it takes multple pictures instead of zooming. Swipe upwards to unlock the lock screen. Motorola camera app allows you to use volume rocker to take pictures. This feature was added in March 2014. Most smartphones vendors (e.g, Samsung) have this feature for long time. Bu tin Motorola camera app, if you hold the volume button, it will take photos continuously until you release the button. It works like burst mode, but it is not because burst mode is available only in 2015 models. If you want to buy a selfie stick, you should try to get a Bluetooth one, not the one with audio cable. The audio cable ones may not work with Moto G.
me again, just realized that the zoom works by moving the finger up or down the screen, which seems that `burst` can be done by screen or rocker. Yes, tapping volume rock and tapping screen are identical (as pressing shutter button). In 2015 models, tapping and hold screen or volume rocker is for burst mode. My camera is OK on the rear camera setting, but when I try to use the front camera I only get a white screen. Hardware problem? Anyone else experienced this? Did you try Google camera app? The camera does not focus clearly on close objects also it takes some time to focues. How to fix this problem? Did you try other camera apps, e.g., Google camera? Moto g3 has more of a yellowish tone in d pics clicked from d default camera app. While moto g2 hasn’t. the colors of objects are more close to real in moto g2. Is there any way to fix d yellow tone in g3? Did you check the photo on the pc? You may also turn on /off the HDR to see whether it makes difference. mine moto g3 has the same issue…yellowish pics..though not seen in laptop/computer….even with google camera photos are almost same…how to reduce this yellow tint?pls help….. Turn on/off HDR to see the which is better. Same issue here. But it does not happen for the first photo you click and after that the sound arises from second clicks and remains on there after. Same case is for screenshots also. Please help .